How can you make sure your loved one makes a smooth and painless transition from a stay in a short-stay rehab community, once the loved one was discharged from the hospital to the comfort of their own home? How Can You Be Sure You – and They – Are Ready to Transition? Ask for a home assessment: The rehab team can conduct a home assessment, during which the patient and a therapist will go to the residence and practice the skills they have been working on in therapy. The therapist can see the size of the home and the size of the rooms. Are there rugs that pose a trip hazard? Should the furniture be re-arranged to better accommodate a walker? Set goals with the rehab team for continuing care: Just because the patient is returning to their home does not always suggest that the rehab is finished. Set goals and milestones that are easy to keep track of in the home environment. They could include walking a certain number of blocks in the neighborhood or joining a workout program at the local gym. Help your senior to be realistic in their expectations: While Mom or Dad will likely want to immediately return to their old routine, that might not be practical – at least not right away. Overdoing the effort can lead to injuries, and the last thing our loved one wants is to have a setback that puts them back in rehab or even in the hospital. Give them a little extra help with chores, and encourage them to pace themselves when it comes to activities. 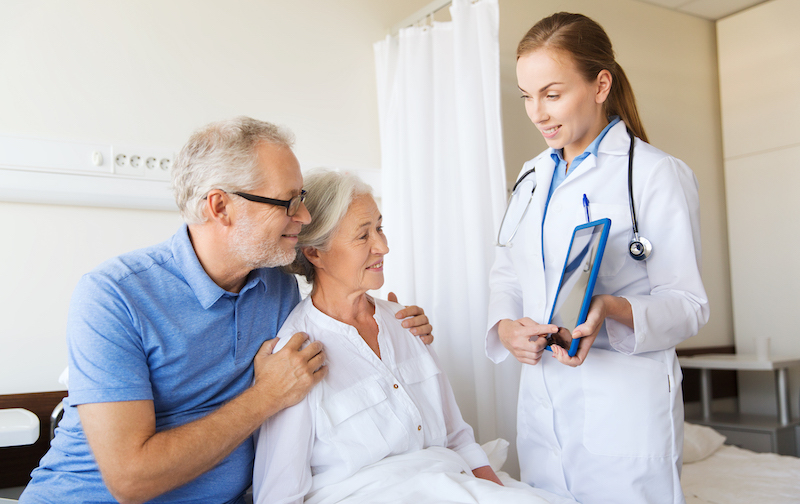 Make sure the orders of the doctor and therapist are followed: When your senior loved one returns home, they will probably have discharge orders to assist them with their continuing recovery. Just as it is important to take your entire prescription even when you feel better to avoid a health setback, it is important for your senior to complete their entire rehab assignment if they want to regain their maximum strength, flexibility, and balance. If you have questions, ask: Your rehab team will help you stay on track even after you leave their facility. Do not be afraid to inquire if you have concerns about your senior’s progress. As we age, steps, high door sills and bathtubs may suddenly cause challenges. Home improvements may be necessary to add ramps, railings, and more-easily accessible bathtubs, toilets, and sinks. A home security system doesn’t only protect your loved one from outside intruders. Many of them have features that allow you to remotely check in on Mom or Dad so you can be sure they are safe when you are busy at work, or so they can contact you if they cannot get to their telephone. If an in-home caregiver is necessary, talk with them ahead of time about your loved one’s personal preferences. It can be stressful having a stranger in the house, but it can smooth the transition if food, home care, and entertainment likes and dislikes are cleared up ahead of time to make Mom or Dad feel more comfortable. It is also a good idea to have the caregiver meet your loved one at the rehab community or hospital so that they can get to know them a little bit before they suddenly show up at the house. If you can’t be there as much as you’d like because of work, make sure to find time after work or on weekends to spend time with your loved one and their caregiver. Listen to both, separately, to assess how the relationship is progressing. If you or a senior loved one is in need of Short-Stay Rehab, Bethesda could be the solution for you. Each of our six Skilled Nursing Communities located throughout the St. Louis area offers Short-Stay Rehab and Physical Therapy treatments for seniors who are recovering from an injury or surgery. Contact us to learn more about this program.